On a cold blustery day in the winter of 1795, Captain Paul Cuffe docked his schooner Ranger in Vienna, Maryland, where he hoped to buy a load of corn. When Cuffe–a man of color, born to a Wampanoag woman and a freed slave–and his crew–all Black or Native men–disembarked, they were met with “astonishment and alarm” by the townsfolk. Locals ran to the docks and urged the Customs officials not to give his ship a landing permit. All his papers proved to be in order, so the permit was issued. It took three weeks for Cuffe to successfully complete his business. By the time of his departure, the people of Vienna looked at him differently. His “candor, modesty, and firmness” had swayed them. He and his crew sailed home, triumphant. From a small plot of land on the banks of the Westport River that spanned less than a half-acre in total, Cuffe operated a steady and successful shipping business of common goods between Westport, New Bedford, Nantucket, and Martha’s Vineyard. The boats on his wharf grew larger and more numerous over time. The 18-ton Box Iron gave way to the larger Sun Fish, which grew into the 40 ton Mary, and finally, Cuffe’s favorite ships, the 268-ton Alpha and the 109-ton Traveller, docked alongside the Cuffe homestead. 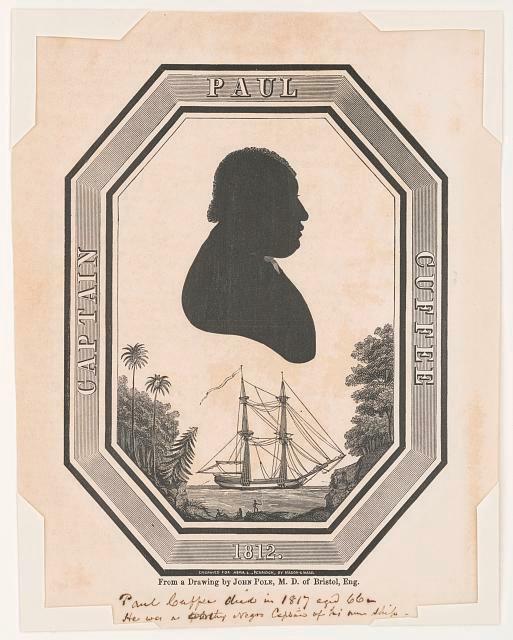 This shipping endeavor turned Paul Cuffe into the richest Black man of his time in America. At each new port, Cuffe and his crew faced the racist reactions of white Americans. 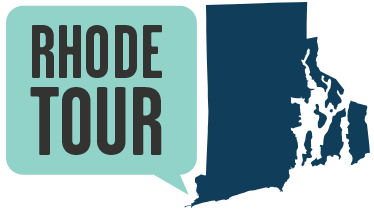 At home in Westport, Paul and John Cuffe fought against racism on the local and state level. As freed black men, they were unable to vote, but were still taxed as any other man. The brothers refused to pay their taxes, claiming taxation without representation, and were thrown in jail. They appealed to the Massachusetts courts, and a law was passed requiring taxation of freed black men, but giving them the same rights as their white counterparts. 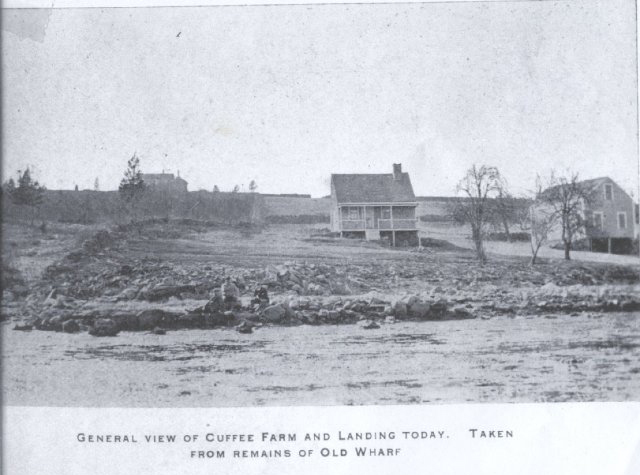 In addition to his family homestead, Cuffe owned or leased extensive landholdings in Westport where he operated businesses like a gristmill and a West Indies goods store. He helped family members acquire property by purchasing land and passing it on under favorable terms. He also provided land to support local widows and as collateral to assist others in starting business ventures. Many of Cuffe’s land transactions helped other people to meet their financial obligations, a practical and generous approach that reflected his public-spirited activities. Cuffe’s philanthropy was extensive. A member of the Westport Society of Friends, he was appointed by the congregation to a committee to decide whether a new Meeting House should be constructed. Cuffe was a leader of that committee and provided half of the costs of the new building, the same one you stand before now. 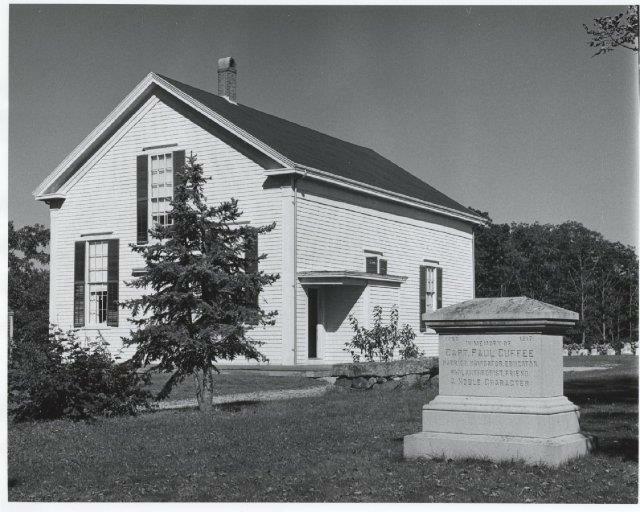 Behind the meeting house is a small group of graves, each belonging to a member of the congregation. Paul Cuffe and his wife lie behind the next house, past a wall, under a tree in a group of inconspicuous Quaker graves. Distinct, prominent, and seemingly separate. This is Paul Cuffe. Charlotte Senders, “Paul Cuffe Memorial,” Rhode Tour, accessed April 21, 2019, http://rhodetour.org/items/show/236. Paul Cuffe, An African-American and Native-American Heritage Trail, paulcuffe.org/wp-content/uploads/2018/03/cuffe2017trailbrochureWEBi.pdf. Barboza, Robert, “Westport Celebrates the Amazing Life of Paul Cuffe on 200th Anniversary of His Death.” Southcoasttoday.com, Sept. 20, 2017, www.southcoasttoday.com/special/20170920/westport-celebrates-amazing-life-of-paul-cuffe-on-200th-anniversary-of-his-death. The Editors of Encyclopædia Britannica. “Paul Cuffe.” Encyclopædia Britannica, Encyclopædia Britannica, Inc., Sept. 10, 2014, www.britannica.com/biography/Paul-Cuffe. Gordon, Ty. “Paul Cuffe: A Captain Remembered.” Southcoasttoday.com, Southcoasttoday.com, June 17, 2009, www.southcoasttoday.com/article/20090617/PUB02/906170354. Harris, Sheldon H. Paul Cuffe: Black America and the African Return. Simon and Schuster, 1972. ONeill , Jenny. “New Insights into the Remarkable Life of Paul Cuffe and His Family.” Westport Historical Society Blog, Westport Historical Society, 27 Feb. 2017, wpthistory.org/2017/02/new-insights-remarkable-life-paul-cuffe-family/. “Westport Researchers Uncover Local Origins of Famous Cuffe Family.”Southcoasttoday.com, Southcoasttoday.com, Nov. 18, 2016, www.southcoasttoday.com/special/20161118/westport-researchers-uncover-local-origins-of-famous-cuffe-family.